From preventing your food from going stale to helping you beat the extreme Delhi heat by giving you cold water and juices or even ice cubes, refrigerators are indispensable to every household. But these can be an expensive investment. And if you are not sure which model and brand to go for, you are in the right place. With our detailed buyer’s guide, we’ll help you find the best refrigerator in India. One that suits both your budget and needs. LG Side by Side Refrigerator: Want a large refrigerator? With 668L there nothing this fridge won’t cool for you. Also, it packed with top of the line features that will keep your meat and veggies fresh for days and with an inverter compressor that helps you save on the electricity as well. Whirlpool WDE 205 CLS 3S: Looking for something on the cheap? The Whirlpool Single door fridge will keep your food cold for 9-hours during power cuts, has a 3-star rating energy efficiency rating and will cost you less than Rs. 15,000. If you have an eye for the fancy, this LG side by side refrigerator is the Ferrari of fridges in India. One that will you and your guests gobsmacked. Have a large joint family? Or do you run a catering/baking business from home? With 668L capacity, you are never ever running out of storage space in your refrigerator ever. So here is where things get interesting and I mean really interesting (jaw-dropping interesting). Firstly, it makes defrosting a whole lot easier. How? By making you not do anything since it is automatic. Also, don’t you just hate when you have to open the fridge for every damn thing like finding out what juices you have leftover? Not to forget, constant opening kills the cooling. But now, you can get a peak of what is inside with just a couple of knocks on the special Insta-view door that lightens up instantly. And for those who wine is jus, you will be happy to know about the wine rack that can hold 4 bottles (you like your wine smooth and sediment free, that is just how you get it). Multi-digital sensors are designed to maintain the ideal interior temperature in case you still need to open the doors on a regular basis. There are also numerous cooling vents that will keep every corner of your fridge cool (so even if stuffed, your food will survive). But it isn’t just about cooling or maintaining freshness, the Hygiene Fresh+ Filter removes foul odor and kills 99.99% of bacteria as well (because what is the point of the fridge if you are not eating healthy, right?). Lastly, there is also a lattice-patterned crisper box responsible for maintaining optimum moisture levels in the fridge for leafy veggies or the broccoli and mushrooms you so love. With the water dispenser gone are days of having to open up the fridge and pour a glass. Just hit the button and from water, ice cubes to even crushed ice, the fridge dispenses it all for you (just the kind of bartending partner you need to turn your Friday’s into FRIYAY’s). Plus, you do not even have to wait for hours for the ice. Just hit the Express Freezing and it will have it done in less than an hour. In case you are worried, all that awesomeness isn’t going to fire back on you with high electricity bills, relax, it won’t and is all thanks to the inverter compressor. This tech adjusts compressor speed based on inside temperature eliminating its need to constantly turn on and off, in turn, using up less power. Not to forget, it also makes the motor noiseless, vibration-free and long-lasting (sound like quite the deal to me). The steel does not just give it a premium look that will add a touch of modernity and class to any kitchen but also ensure it lasts you for years to come (yup, these bad boy isn’t going away for even 10-12 years). The toughened glass shelves are also quite strong and can easily take the weight of even the heaviest of utensils without cracking or breaking. Well, if you weren’t already impressed, how about a fridge you can control via your mobile? Yes, with the SmartThinkQ app, you can diagnose problems, change temperature or even have set express freeze so you never run out of ice. Also, there is a small utility box for all your tins and cans or the butter box can be put away neatly. Also, it will cost you in excess of 1 lakh (aaghhh if only the awesome things were cheaper). But the question you should be asking is if it is worth it? And the answer to that is a sure shot yes. For those with a large family and home, it is hands down the best bet. Crisper box helps maintain moisture ideal for leafy vegetables, tomatoes, etc. Call it the little brother of the above-mentioned fridge, it is just the as smart and energy efficient making the best pick for any standard Indian household. This LG model has a 260L capacity to take care of the day to day necessities of the 3-4-member family. The freezer compartment to is large enough. You want to stock up on the non-veg for the whole week, you can do just that. There is also plenty of rooms for all your bottle and other necessities on the door while the freezer door also has shelves you will find pretty handy for the smaller stuff. For cooling, this fridge has features very similar to the or top pick. For example, there are multiple vents so no corner of your fridge remains hot. After all, maintaining a balanced temperature is everything. But what about the door area? Well, that part of the fridge is not neglected either as the fridge comes equipped with a special Ice Beam Door Cooling Technology that maintains even temperature there as well by circulating the air throughout. The Ever-Fresh Zone will keep all those apples, capsicums, lettuce leaves fresh and moist as it comes with humidity control. There is also a lattice-shaped crisper you will find quite handy for the same. And you do not have to be fighting a war with your ice trays to get those damn ice cubes out with the simple Double Twist System. Twist and let the ice cubes get collected in the tray below (trust me, that will take no more than a few seconds). Lastly, all defrosting is done automatically. Not only does it have a 4-star rating from the Bureau of Energy Efficiency but if that didn’t convince you, the inverter compressor should for sure put to bed any fears of high electricity bills. Such compressors do not turn on/of constantly and operate at different speeds depending on the load so they consume less electricity (as you probably already knew). Also, these compressors produce little to no noise and are vibrationless. They have also been tried and tested to last longer than regular compressors. This fridge too is compatible with the SmartThinQ App which means you can control quite a lot feature like temperature etc. using your mobile from anywhere anytime (now adjust fridge temperature while at the movies or work). Plus, you can always diagnose plenty of problems that may occur with the fridge over the course of its lifetime and helps you call in an expert just the press of a button. If you want to hit the Eco-friendly bandwagon you can even have the fridge work on solar energy (yup, you can even do that now). All you need is a solar panel which will need to be purchased separately though it is a worthy investment will lower your electricity bills further. This is where LG really steals the show especially for those people tired of power cuts and fridges that drain the home inverter quickly. With the Auto Smart Connect, the fridge will run on the home inverter at a power of less than 2 CFL bulbs (and I am not even kidding). So you can store as much food as you want in your fridge without worrying about power cuts as now, there is no turning this refrigerator off. The steel build is average looking but if you weren’t here for the looks, it gives it maximum durability and makes it an investment of the future. Require you to bend since the vegetable basket is quite low. If you do not have an inverter, the fridge does not come with a special keep cool feature so yeah, you are in trouble then. Lastly, the design is quite basic. Looking for something on a budget? At less, than 15K, you can hardly any better than this Whirlpool fridge and is an Amazon best-seller for good reason. The Whirlpool comes with a 190L capacity which makes it a great buy for couples and 3-member families in need of something compact and cheap. The freezer space is decent too and you can easily stack ice trays up in case you do not want to run out of ice during a party or gathering. And obviously, there are shelves on the doors as well which can be used to store your water bottle, cold drinks. The compact size of the fridge ensures the vents can easily keep the fridge cool all around (even the door) for optimum cooling. The large crisper at the bottom does not just give you space for an entire week of vegetable but will keep them fresh so they last you that long. Also, playing an important hand in that and maintaining moisture in the vegetables are the honeycomb moisture lock on the crisper and the moisture slider. And if you are throwing a party and want to store tons of beer cans the chiller will not only cool them faster but also keep that way longer (because what is a party without icy chilled beer, right?). And once you run out of beer you can also use it for milk or any other food items that need to be cooled quickly. While the defrosting is not automatic (so yeah you will need to keep an eye out for any frosting) it is still easier than with most other fridges. Just turn the defrost knob to the speed at which you want the fridge defrosted and your will shall be done ASAP. For a cheaper model, we are quite happy to see it comes with a 3-star BEE rating so you can rest assure your electricity bills will not be skyrocketing. The build is pretty average especially when it comes to design/looks but I guess that shouldn’t bother you much in any case since it is a cheaper model. If you don’t like the Blue, my preferred choice in the Red (looks way better). The wired metal shelves are pretty sturdy though and will not break under any circumstance. The top handle is a nice touch and does add a touch of modernism to it and since it is quite compact and light, it can be placed anywhere in the house and moved rather easily as well. It comes with a built-in stabilizer so you do not need to come additional purchases and it does not breakdown due to a power surge. The gaskets can be removed within minutes and can be cleaned to prevent any mold and mildew from growing on the inside. First and foremost, it needs to be defrosted manually. While that is easier in the model than in most single door fridges, it still takes up some of your time and needs to be done regularly. Secondly, it too requires you to bend in order to reach for the vegetable and fruit basket. The freezer is great for ice but pretty small otherwise which means you will not be able to store meat products or even chill too many beer cans or cold drinks in it. Lastly, it is not the most durable of fridges but should last you for 2-3 years without any trouble as long as you clean and defrost it regularly. Drawbacks aside, for anyone on a budget or looking for a backup refrigerator, the Whirpool punches way above its weight and will help you get the best bang for your buck. Haier has a simpler solution for standard Indian homes that do not compromise with your food and convenience. This Haier fridge has a 320L capacity which means for a family for 3-4-member living in a 1500-2000 sq. ft. apartment, this just right fit. Similarly, the freezer also is large enough i.e. 86L so there is room for not just ice cubes but also for all the meat, ice creams and other frozen foods you so crave. In the back part of the door, there is ample space to store even the tallest of bottles and space for the butter and other items you will on the go. With the fridge, say goodbye to the back-breaking habit of having to bend for the vegetables every day. Why? While the freezer on the bottom is equipped with a special tech that can bring freezer temp down to -5-Celsius in just one hour (ice cubes in just 60-minutes, not bad at all). And getting ice out of the tray does not require hours of banging and beating the ice out. With the Twin Twist System, all you need to do is give the trays a twist without having to take them out and all the cubes fall nicely into the box below which slides out easily. Not only will the fridge itself take care of defrosting, during any power cuts, but your food is also safe and sound from any degradation for a whole 10 freaking hours due to the larger cooling pads that retain the coolness longer. Another reason for it is the 360-degree cooling tech that keeps your food fresh and yummy even after days by ensuring equal cooling in all parts of the fridge. It has one of the largest crispers in its class that will help you keep your fruits and vegetables fresh and bright for longer (just the way they are meant to be). The brushed steel finish is sure to keep a few eyes glued to it, even get it a couple of compliments but more importantly, the steel build guarantees you long life. Same is with the 4 toughened glass shelves which do not crack under pressure that easily. Yup, even if you have huge pots, these bad boys don’t break that easily. To make room for those bigger pots, you can also remove any of the shelves as they simply slide out so cleaning them is easy too. The fridge has an in-built stabilizer. This protects the compressor from any power surges without you needing to spend extra on a stabilizer (always good to know where one can save a few bucks). It only has a 3-star rating. While a 5-star rated inverter fridge is obviously going to be more energy efficient, it sure does a good job. It can also be a little noisy when compared to the LG model we talked about above but nothing to wake you out of your sleep. It is also on the expensive side considering you can find cheaper double door models as well but if functionality and convenience is your priority, this is well worth the cost. The 86L freezer has ample room for freezing non-veg, ice cream etc. From the budget pick to one that might just steal your heart away with both features and bold design, Whirlpool continues to show why it is so highly rated when it comes to home appliances. Since the 260L is divided into 3 doors, there is actually more space than you would think. So I am pretty sure for a family of 3-4, space will not a problem whether it is the freezer or the vegetable basket below. Air booster not only keep the whole compartment cool but circulate air to prevent odor build up. It also helps maintain precise moisture levels. To keep the food from getting infected by virus and bacteria, the fridge is equipped with the Microblock technology and it does exactly what the name suggests, blocks 99% bacteria. But the tech that really caught my eye is the Zeolite Technology. This absorbs Ethylene emissions so do not end with overripe fruits and vegetables (double the freshness, never a bad thing). All your vegetables and fruits go into the bottom door and thus remain separated from the rest of the food items so they never catch odor and remain fresh longer. This freezer too has a Twist System for the ice cubes. There are multiple compartments as well. The lower one is suited for freezing meat while the upper compartments can have ice creams and frozen desserts to help you beat the heat. I like the silver finish of the fridge and the recessed handles make it even more attractive. It does not have an inverter compressor so it can be noisy but not so much to be annoying or disturbing. Plus, it is also not an energy efficient some of the other fridges. And lastly, it does not come with lights in the freezer or the vegetable/fruit basket in the bottom. Zeolite Technology prevents the over-ripening of fruits and veggies by absorbing Ethylene emissions. If you are talking about home appliances it is hard to leave out Samsung considering they are known for their high-end products and reasonable prices just like with the Samsung RT28M3022S8 refrigerator. From your leftover food, water bottles, juices cans, and packets to even carton milk, with 253L, a family of 2-3 should have no trouble keeping these essentials cool and safe with multiple shelves. And you can also get all your ice cubes, store some ice cream and dairy products in the spacious freezer. Maintaining temperature is everything in a fridge to keep things fresher. This is why Samsung equipped each shelf with 2-3 separate air vents (there no corner this one is leaving out). And isn’t it hard when you have to bend really low and look for something at the back of the shelf? Not anymore, just slide the shelf out or organize each shelf just the way you want it to be. For all the easily perishable fruits and vegetables, there is the Moist Fresh Zone. A basket where helps retain moisture when needed and eliminates it through vents when needed to keep those food items fresh. The shelves on the door have been specially designed to fit in a bottle of all kinds. From a 2L coke bottle to even a small Gatorade bottle, you can fit it all in. Defrosting is done automatically by the fridge saving you the trouble. All the ice cubes can be twisted into the large collection box below so you always have plenty of ice on the go and taking it out is not a pain either. And when not needed you can always make some additional room be removing the ice cube collector. Power cuts spoiling your food will also be a worry of the past since the cool pack in the freezer and cool wall in the lower compartments can maintain the coolness for 12 straight hours. Truth be told, the 2-star BEE rating is not impressive but the inverter compressor sure does boost its energy efficiency by varying running speed based on the temperature and load in the fridge. But there is more an inverter compressor impresses us with like the fact that it makes little noise and gives the compressor a longer life. If you have kids that often forget to close the fridge door, the door alarm will ring in 2-minute to notify you of it and to prevent wastage of both food and electricity. The build is quite good and I liked the brushed finish as well but it is the toughened glass shelves that really take the show. Why? Because they can hold about 150kg. So whatever your pot size or however the heavy the fruit is, it is not going to be an issue. To keep the compressor for short-circuiting or other kinds of damage during fluctuations, there is a built-in stabilizer. And to help you maintain healthy and hygiene inside the fridge by keeping out all sorts of bacteria and fungi, the door gasket can be removed and cleaned thoroughly. Not too big a feature, but any minimalist will sure come to love its recessed handle. Like the LG model, this too can run on your home inverter without sucking up all the power from it so your fridge does not have to off at all. Energy efficiency of the fridge could have been better as it has only been given a 2-star rating by BEE. You will also have to bend in order to reach the basket. The best way to avoid overspending or making the wrong choice is to know what you need. So below we covered the features, types of refrigerators, etc. you need to know about before making a buying decision. Also known as direct cooling refrigerators, these pretty straightforward in design. You have a single door and the freezer box is located within the single compartment rather than separately on the top. One of the main reasons these refrigerators are common in a household in because they tend to be the budget buyer’s choice and cost significantly lesser than other types of fridges. Also, these are more compact and easily fit into the smallest of kitchens. But that comes with cons as well. For starters, these fridges end up with frost in the freezer and defrosting needs to be done manually on a regular basis which makes these fridges more labor intensive. Also, capacity is usually pretty low as it can it usually does not exceed around 200L. This means it suits only smaller families or for those on a low budget or need a good backup fridge. 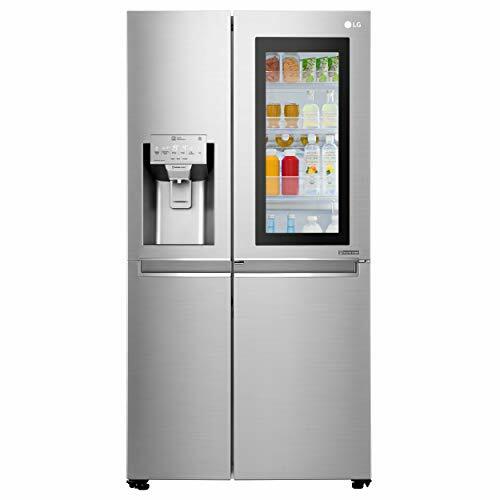 The main difference between a single door and double door fridges is that these come with to separate doors with the freezer located in the top or the bottom. You do not have to defrost the freezers manually as that is taken care automatically by the heating element in the fridge. Capacity with these fridges can vary between 250L to 350L but keep in mind, the larger the capacity the higher will be the cost. Also, while they are less energy efficient as compared to single door fridges, they sure do perform better when it comes to cooling and are less labor intensive. These are the more popular double door refrigerators where the freezer is located above the main cooling compartment. My only with these fridges is that you need to bend over anytime you access the main compartment. As you might have already figured out, here the freezers are located at the bottom with the main compartment at the top. This is based on the study that people do not access the freezer as much as they access the main cooling compartment, in turn, eliminating the need to bend every time. But they tend to consume more electricity than top mount fridges and cost higher as well. You want convenience, you pay for it. These fridges usually have about 3 doors with the top compartment acting as the freezer. The cooling section is in the middle while the lowermost part usually has a vegetable basket that has been specially designed to keep the fruits and vegetables fresh and free from moisture. Yup, they need more power to run on a day to day basis but offer better functionality and higher capacity. These are some of the fanciest models in the market. With features like an instant view window or those that will keep your fruits and veggies fresh for days together, if you have the budget, you do not want to miss out on these. They also offer the largest of spaces that can vary from 600L to 700L and even have a water and ice dispenser which eliminates the need for you to open the fridge every time you want to grab a bottle of water. I think it is obvious that they will be consuming the most electricity but also offer benefits and convenience like none other. This simply means the freezer to the cooling unit ratio. This is usually around 80:20 and the reason behind that is the higher number of vegetarians in India since they in the most likely hood will be storing fewer items in the freezer. But there are other variants as well like the 70:30 fridges which give you a slightly bigger freezer compartment so you can easily store all the meat. And in case you want something even more advanced, you also go for models that let you switch convert for freezer into a fridge at the press of a button so you not only get increased storage when need be but do not have to sacrifice on freezer space as well. But keep in mind, such fridges can be expensive. Like I said earlier, if you want convenience you will have to pay for it. The inverter technology is something you will come across not just in fridges but also AC’s, dishwashers and even washing machines. So what makes this technology so important? That is because it makes your appliances more energy efficient. To be precise, it can save you up to 40% on your electricity bills. But how does it do that? Here to the inverter technology eliminates the need for the fridge to switch on and off each time the set temperature is reached which consumes more electricity. For this, the fridge compressor continues to run at varying speeds as per the load and set temperature which results in more constant electricity consumption. Well, power cuts can be a real pain and more so if you have tons of cooked and uncooked items in the fridge as it reduces their shelf life but fridges have advanced over the years and brands have found a way to tackle this issue as well. Some fridges especially a few LG models have designed to maintain temperatures for up to 2-7 hours after a power cut. But these technologies also bump up the prices but if you live in an area with constant power cuts, it sure is worth the investment. We first wrote about BEE ratings in our post about the best air conditioner in India and here also it defines energy efficiency, only this time, of the fridges. These ratings are given by the Bureau of Energy Efficiency with 5-star being the most energy efficient of the lot. Similarly, there 3-star and 4-star fridges are common too. But keep in mind that these ratings are only available for frost-free double door and direct cool single door fridges. You won’t find BEE rating for multi-door, side by side and bottom freezer fridges. So what do you then? Well, just make sure you get a fridge with an inverter compressor and it won’t be much of an issue. Which are the best refrigerator brands in India? Here are the top 10 brands if you are looking for a refrigerator in India that will offer you real value for money. Most high-end refrigerators can easily last you for 18-20 years whereas most others will last you around 12-13 years. The cheaper models come with a lifespan of 10 years. How to tell if a refrigerator is going bad? One of the most obvious signs of a compressor going bad is if the cooling is not at optimum levels. Note: Most fridges come with an automatic defrost system but if yours does not, you would want to keep an eye on it. Refrigerators make loud noises when the condenser fan motor malfunctions so you would want to give that a check. The size of the refrigerator is directly related to the energy consumption of the fridge. So let’s say you buy a 5-star rated fridge of 263L, compared to a 5-star 180L fridge it is likely to consume 70-80 units more. Also, note that refrigerators only offer value for money when they run at full capacity. This why I’ll repeat, make sure you know exactly what size you are looking for, You really do not want to lose money over this. So that is pretty much everything we have to say when it comes to buying the best refrigerator in India. I know the choices can be overwhelming and this why our team has worked towards narrowing it to the top choices based on both budget and needs. Some of like it fancy, some a simpler and cheap and there is one for everyone. In case you have any questions, do get in touch with us.